Objective of the game: by spinning reels, get a winning combination of the simbols. A winning combination is the sequence of 5, 4 or 3 identical simbols involving left and right reels. All winning combinations are paid according to payout table at the bottom of the page. The Star symbol is Wild and can replace any of the gems on the reels. If a Wild symbol covers two combinations on one line, the combination with a greater coefficient is paid. The number of playing lines is set by pressing up and down arrows located next to “Lines” indicator. You can set 1, 3 or 5 lines only. The bet for each playing line is set by the arrows near “Bet per line” indicator. The cost of one credit equals to 0.01 xBTC or 0.1 xBTC. The reels are spinned by pressing GAME button. When playing for cash, autoplay function becomes available, which is activated by pressing AUTO button over SPIN button. In this mode, if there is no win in the main game, the next spin occurs automatically, while keeping the same bets and the number of lines. If a spin is winning, the reels start spinning with a two-second delay, for the player to make a decision to start gambling game. ПAs the player wishes, after payment in the main game, he may try to double win. To do this, press RISK. 15 closed cells will be shown to the player. 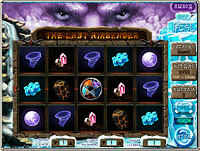 To start gambling, the player shall click on any cell. When the player opens an empty cell, he loses current win. If a Symbol Of The Elements is in the selected cell, win will be doubled, and a new gambling game level will be offered, and one cell that does not contain a Symbol will be automatically opened. Maximum number of levels in gambling game is six. The player can abandon another attempt to double, take win and return to the main game. To abandon gambling game, press GAME button. On the 1st level, the player has chance to double 7/15. On the 2nd level chance to double is 6/13. On the 3rd level, chance to double becomes equal to 5/11. At 4th level, chance to double is reduced to 4/9. At 5th level, chance to double is 3/7. And at the 6th level, chance to double is 2/5. THE LAST AIRBENDER slot machine has fair play control system. Below is a layout of 42 reel symbols. Fair play control system applies to the game per lines and gambling game. Reel offset can be set as described on Slot Machine Fair Play Control. Ways of reel stopping and gambling game of SEVEN GEMS slot machine are the same as the mechanisms previously detailed in Slot Machine Fair Play Control on the example of Crazy Monkey slot. The line RiskGame=0, 1, 0, 1, 1, 0, 1, 0, 0, 0, 1, 1, 0, 0, 1 determines the presence (1) or absence (0) of the Symbol in the cell. The order of the cells is from left to right, top to bottom. The line Bonus=0, 1, 1, 1, 1, 0, 1, 1, 1, 1 etermines the presence (1) of the Symbol in the cell which gives a prize coefficient or absence (0) of the Symbol in the cell (Exit). The order of the cells is from left to right, top to bottom.